Here’s a challenge for you. Try to think of any animals that start with n. Go ahead, I’ll wait. Can you do it? No? Most people can’t think of a single one! I used to play the animal alphabet game a lot when I was a kid. (You know… I went on safari and I saw an Alligator, a Bear, a Camel, a Dugong, an Elephant… and the next person thinks of an F animal and so on.) But whenever it was time to think of animals that start with N, we were totally stumped. It was surprisingly difficult! 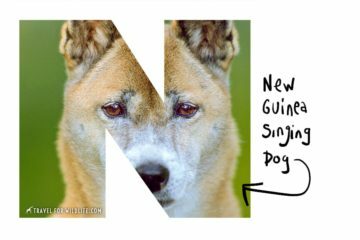 If you’re trying to make animal alphabet art you’re probably having the same problem finding interesting animals that start with n! No problem! I’ve got the perfect list of cute animals that start with n! 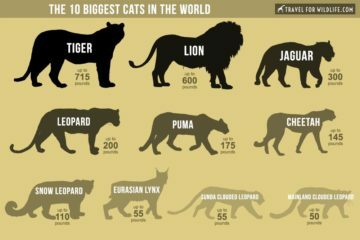 And if your want to go even deeper, check out our other post with over 700 multi-word names of Animals Beginning With n: the Humongous List! Still can’t think of any animals that start with n? Then read on and get ready to impress your friends and family. 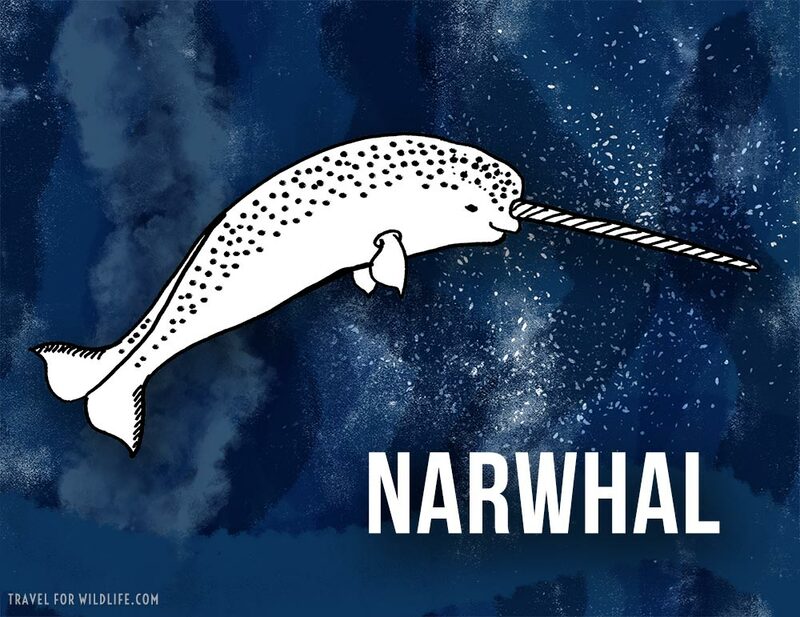 This is my absolute favorite of all the animals that start with n. The Narwhal! (Monodon monoceros). It is a medium-sized whale that lives only in the cold waters of the high arctic. Its most recognizable feature is the spectacular spiral tusk that grows out of it’s head. This is actually a tooth that grows straight through the skin and can grow up to 9 feet long! It is a very sensitive instrument and is full of millions of nerve endings. 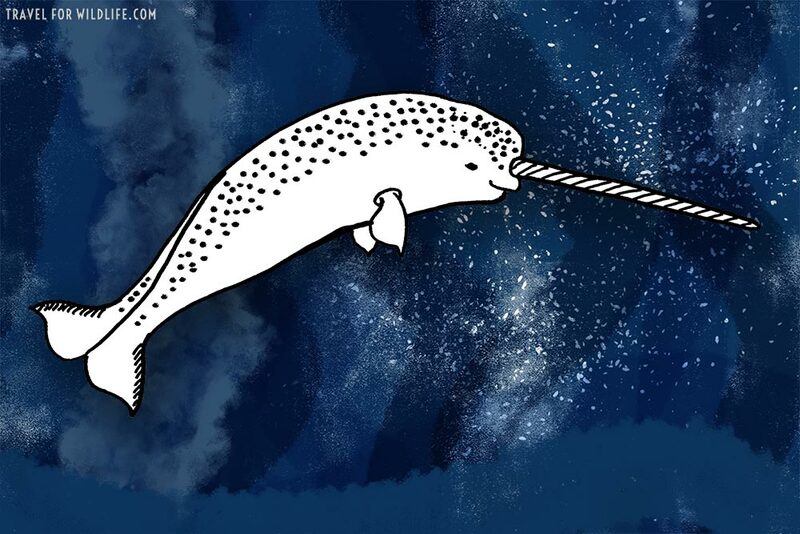 New footage reveals that narwhals use the tusk to tap fish and stun them to catch them! The common Nightingale (Luscinia megarhynchos) has inspired poets and writers for thousands of years with its beautiful and complex song. 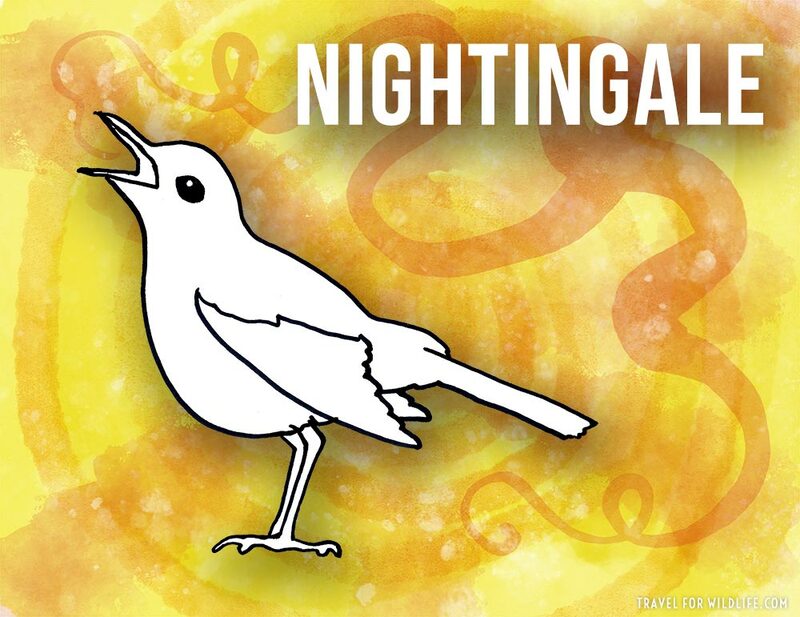 It makes appearances from Homer’s Oddyssey (8th Century BC), to Shakespeare, to John Keats’ “Ode to a Nightingale.” Found across much of Europe and Asia, Nightingales are one of the few birds who sing at night (as well as during the day) which is what earned the common name, meaning “night singer”. 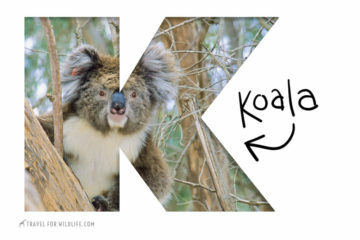 This is one of the most popular animals that start with N in animal alphabet art! 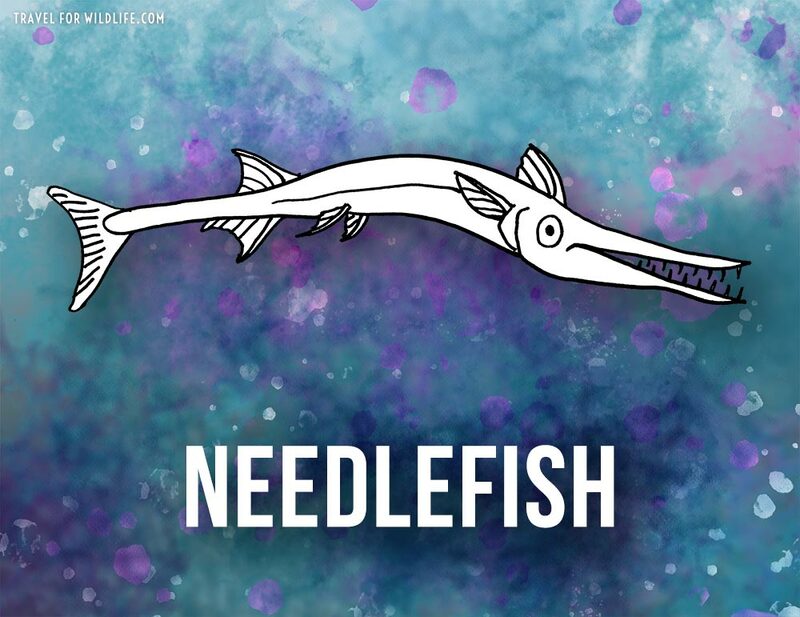 Needlefish are a family of long, thin fishes that have a long beak full of sharp teeth (the Belonidae family). Some species grow up to four feet long! I guess you could call it a needle-shaped fish with a mouth full of needles. Those sharp teeth may look a little scary but you’re more likely to get impaled by a needlefish than bitten by one. Needlefish live near the surface and often leap above the water to travel quickly. They get particularly excited around sources of artificial light at night and may accidentally “fly” straight into people on boats! 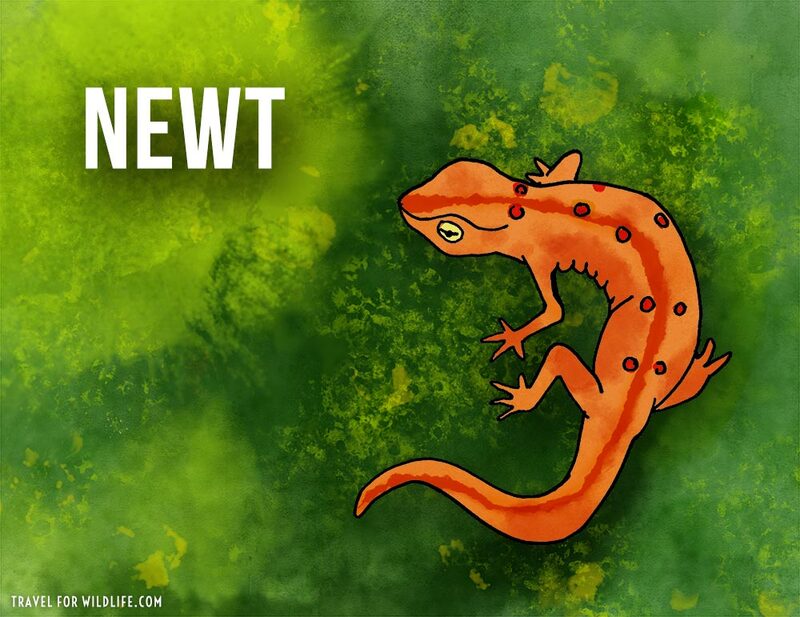 If you were able to think of any animals that start with n, it was probably the newt. Newts are amphibians in the salamander family, but there is a lot of confusion over what exactly a newt is because in some parts of the world “newt” and “salamander” are used interchangeably. More technically, newts are a subfamily of the salamanders called Pleurodelinae. The crazy thing about newts is that they start life as an aquatic larva with gills, then metamorphosize into a juvenile terrestrial stage with lungs (called an eft), and then transform again back to an aquatic (or semi-aquatic) adult stage to reproduce! The drawing below is a red-spotted newt in the terrestrial eft phase. And here’s a photo of one we saw in the Great Smoky Mountains, NC. 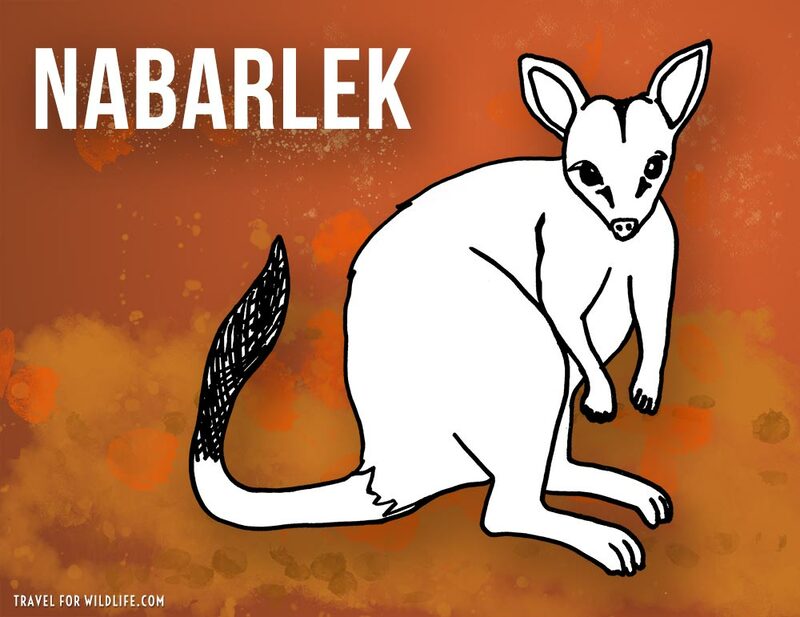 The Nabarlek is a tiny wallaby found only in the extreme northwest corner of Australia. Also known as the Little Rock Wallaby, it is the second smallest member of the Macropodid family (kangaroos and wallabies) standing less than a foot tall and weighing less than 3 pounds! The Nabarlek (Petrogale concinna) spends most of its life hiding in rugged rocky landscapes and only emerges at night to feed on grasses. It is the only marsupial in the world that can grow an unlimited number of molars! The molar teeth are continually worn down by its diet of abrasive grasses and are constantly replaced by a conveyor belt of new molars erupting from the back of the jaw. It is classified as an endangered species by the IUCN because it is rapidly disappearing across its range. While it is known locally in South America as the Nandu, (more correctly spelled Ñandú) people like me in the U.S. are probably more used to hearing it referred to as a Rhea. The Greater Rhea (Rhea americana) is the biggest bird in all the Americas. It’s almost as tall as me! It’s also one of the largest birds in the world (after the ostrich, emu, and cassowary). Like those other huge birds, it cannot fly. The other two species of Ñandú: The Lesser Rhea (Rhea pennate) and Puna Rhea (Rhea tarapacensis) are a bit smaller but no less impressive. I saw some cool Ñandú crossing signs while driving around in Patagonia! The Nightfish (Bostockia porosa) is an ambush predator who hunts only at night. But don’t get too nervous, it only grows to about the length of your hand (6 inches). A member of the perch family, the Nightfish can only be found in freshwater streams, lakes, and ponds in coastal Southwestern Australia. It hunts other small fish, as well as crayfish and aquatic insects. 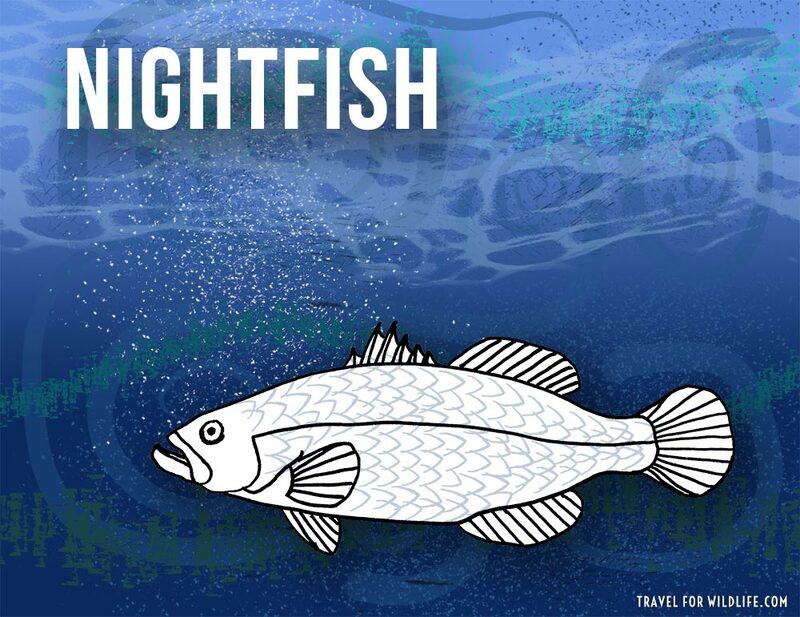 You can find more info about the Nightfish on Fishes of Australia. I think this may rank as my second favorite of all the animals that start with n, the Nautilus! These guys are very special members of a very special group of animals: the Cephalopods (which includes the octopuses, squid, cuttlefish, and nautiluses). 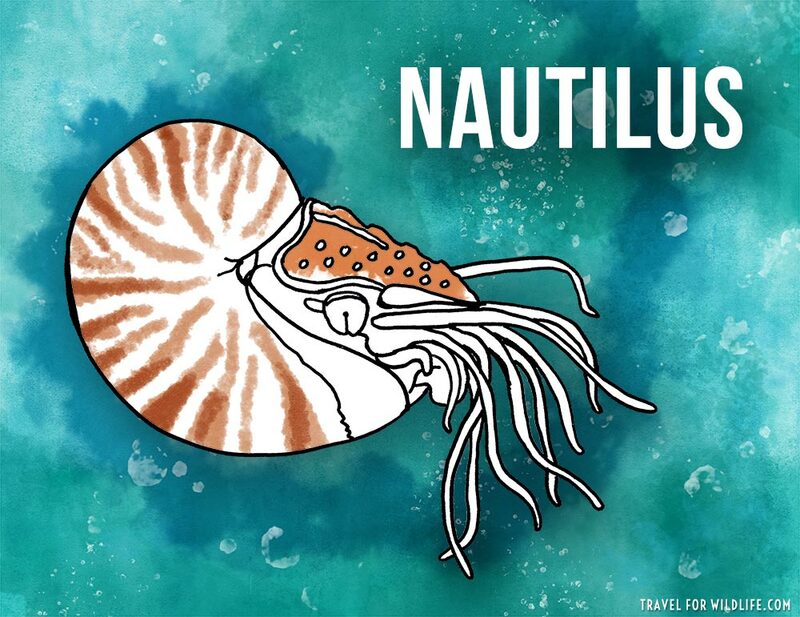 Nautilus are basically living fossils because they have existed on the planet for more than 500 million years! They have empty chambers inside their spiral shell which are filled with an inert gas to maintain neutral buoyancy, and they swim around with jet propulsion! On an unrelated note, if you try to search the scientific name of the Nautilus, you many accidentally end up listening to an 80’s Russian rock band by the same name: Nautilus pompilius. 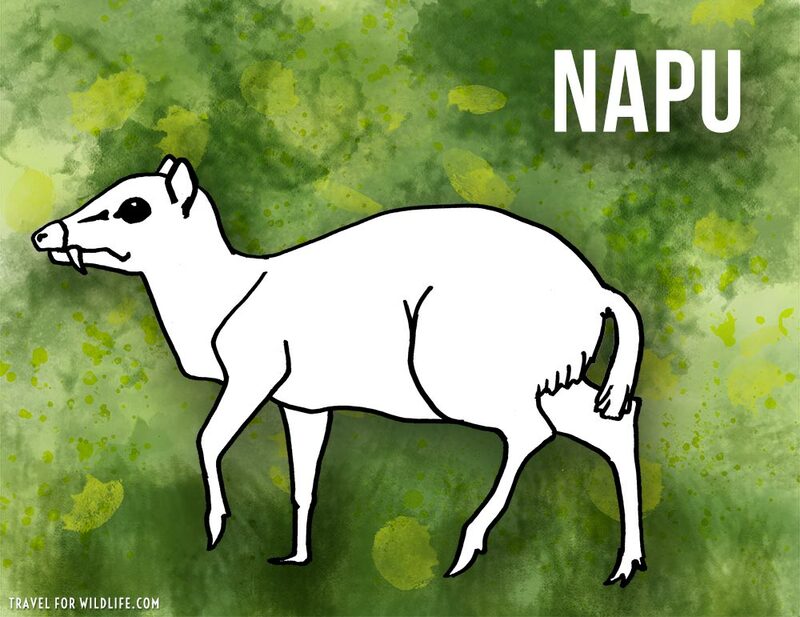 The Napu (Tragulus napu) is a tiny ungulate found only in Southeast Asia. Standing barely a foot tall at the shoulder, it is ironically one of the largest members of its genus. Also commonly known as the Greater Mousedeer, it is neither or mouse, nor a true deer. It is in fact a member of the Tragulidae family (comprising the 10 species of chevrotains and mouse-deer.) Male Napu have no horns or antlers. 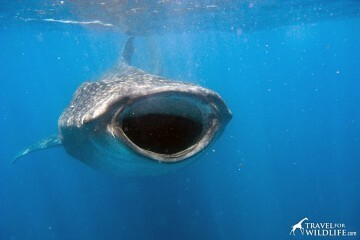 Instead they have tusks: enlarged canines projecting down from the upper jaws. Perhaps they should be called Creepy Mini Vampire Deer instead? The Nightjars comprise about 100 species of nocturnal and crepuscular birds in the family Caprimulgidae. They are masters of camouflage and, unlike most birds, will often perch lengthwise along a branch to blend in perfectly. 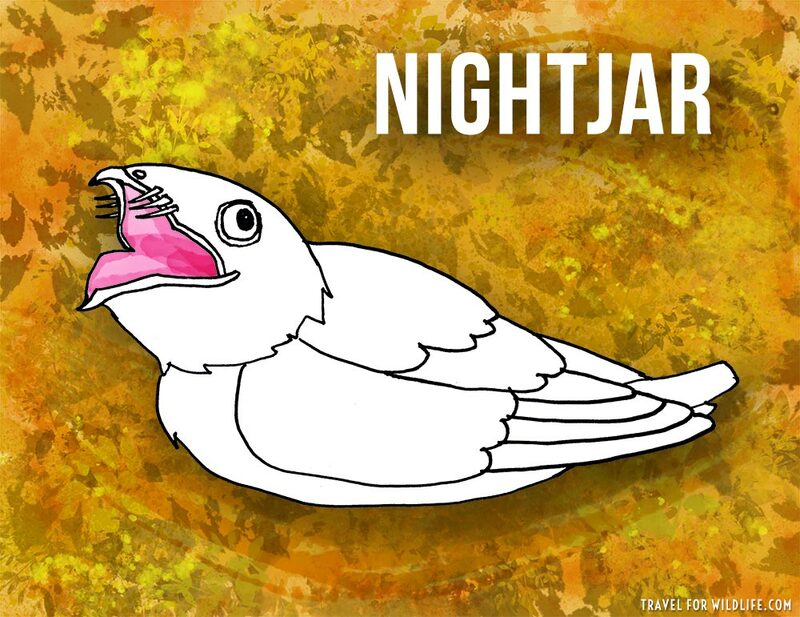 Nightjars are found around the world. We often see them flying up from the dirt roads during night drives in South Africa. And right here in our own back yard in North Carolina we hear the call of an American nightjar species: the Eastern Whip-poor-will. Here is a nice collection of North American Nightjar species and their beautiful calls, on Audubon. 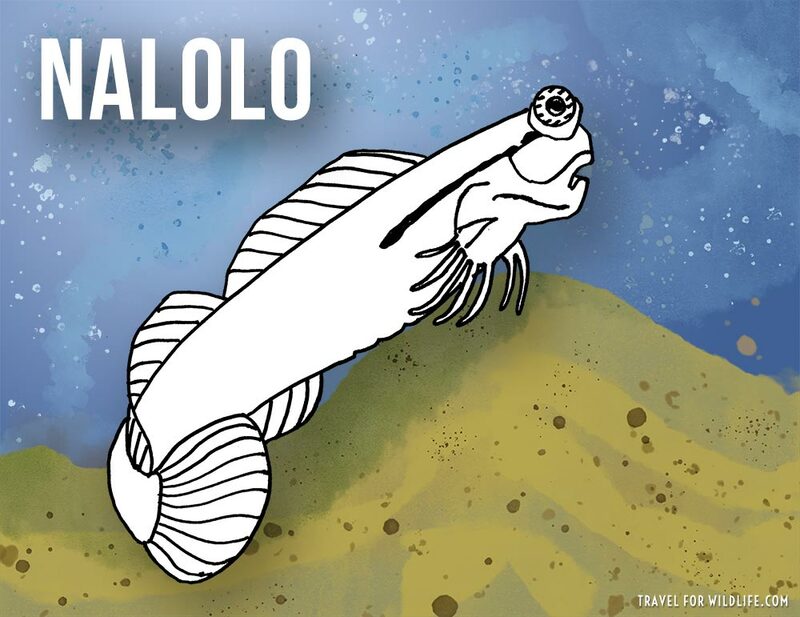 The Nalolo is a tiny fish found in coral reefs of the western Indian Ocean, growing to only 2.5 inches long. The Nalolo (Ecsenius nalolo) is a member of the Combtooth Blennies family, meaning it has a row of tiny comb-like teeth in its mouth! Like other blennies, they rest on the bottom and “walk” on their pectoral fins. 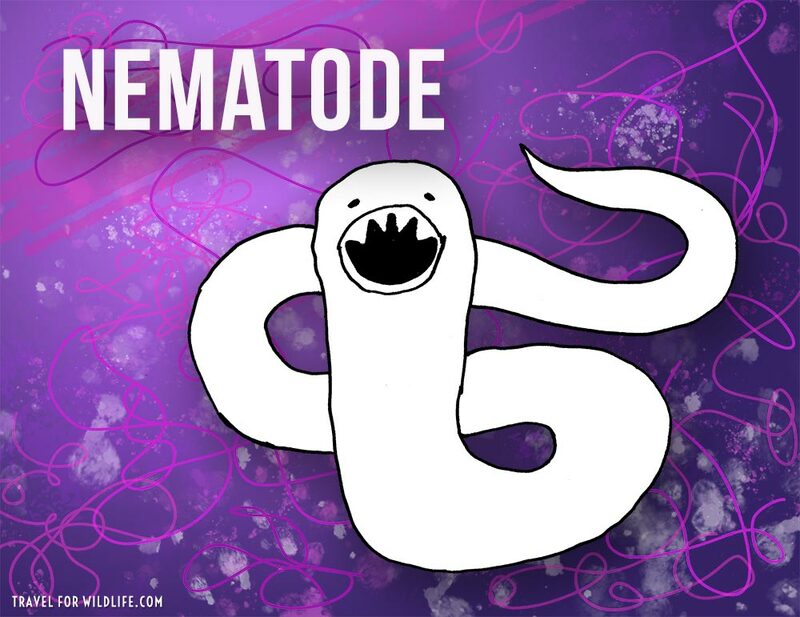 It’s a little unfair to refer to the Nematode as an animal when in fact nematodes are a group of many thousands of different species of animals. In fact, nematodes (also known as roundworms) are probably the most numerous multi-cellular animals on the entire planet in terms of both biomass and number of species. The Nematodes represent an entire phylum of the animal kingdom: Nematoda. Most are parasites of other animals, including the delightful Old World Hookworm (Ancylostoma duodenale) which I have illustrated below. 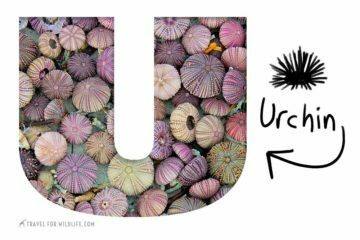 You might find this little fellow (about half an inch long) living inside your small intestines! 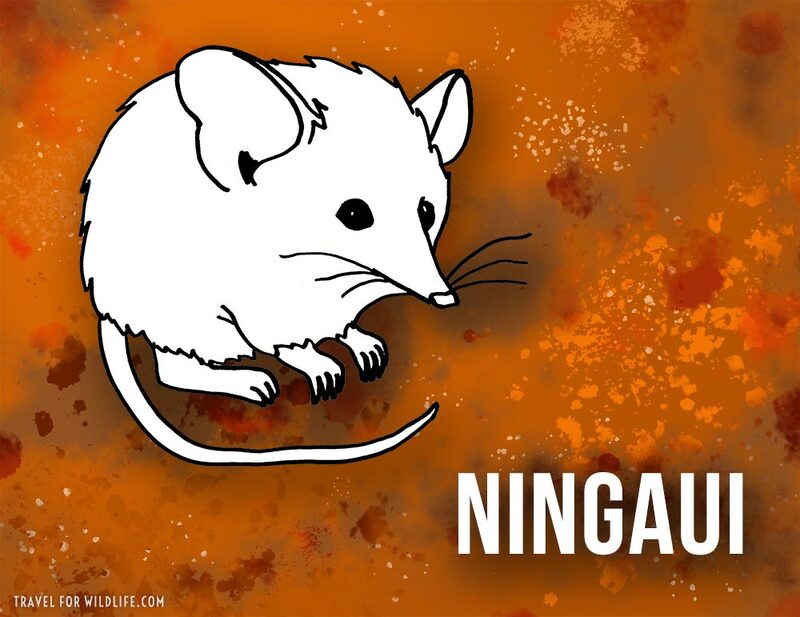 Although it may look like like a little rodent, the Ningaui is a tiny carnivorous marsupial found only in Australia. There are three species: the Wongai Ningaui (Ningaui ridei) the Pilbara Ningaui (Ningaui timealeyi), and the Southern Ningaui, (Ningaui yvonneae). 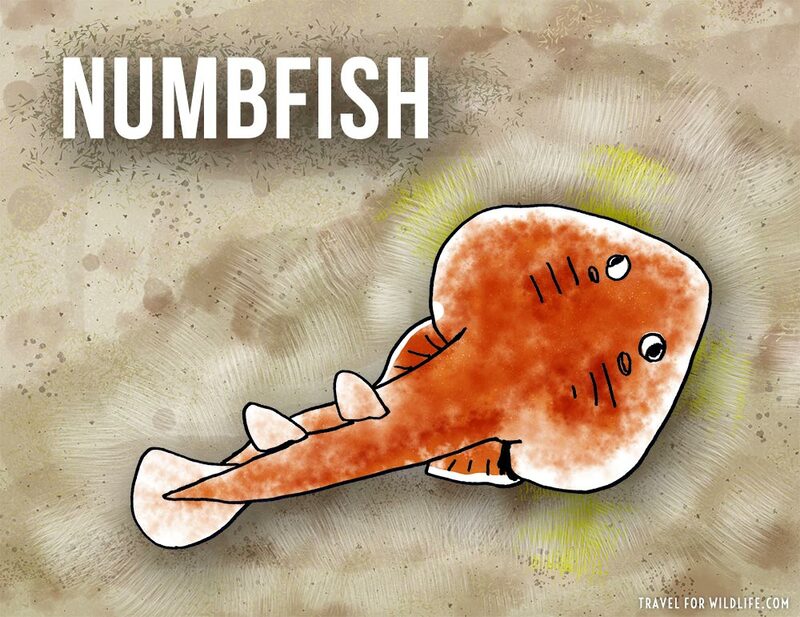 Amazingly, these secretive little animals were not even discovered until 1975! Weighing less than 10 grams (smaller than a mouse) they are voracious predators of insects, attacking them with their sharp teeth. They are named after tiny hairy creatures from Aboriginal mythology that only come out at night. 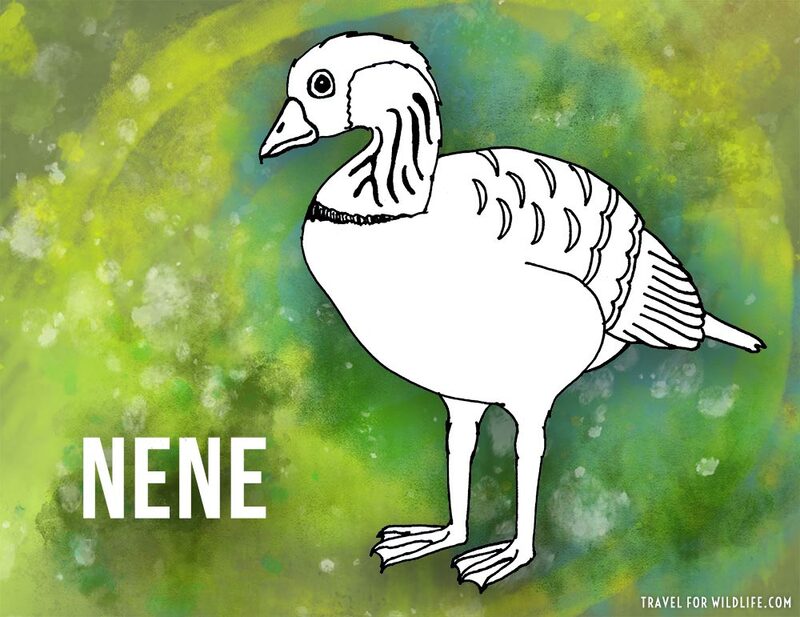 The Nënë is a beautiful goose that lives only on the Hawaiian islands. Also known as the Hawaiian Goose (Branta sandvicensis), the Nënë had nearly gone extinct by 1950 due to extensive habitat loss and predation on nests by non-native animals like cats, dogs, pigs, rats, and the small Indian mongoose. It is now the world’s rarest goose. 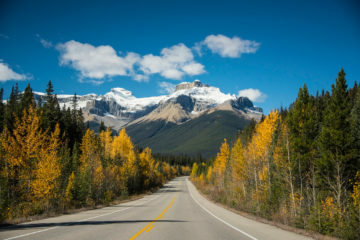 Thankfully an intensive conservation effort has been underway for several decades. In 1999 there were less than a thousand but by 2011 there were 2,500. The wild population is still heavily dependent on releases from a captive breeding program. The name Nase usually refers to the Common Nase (Chondrostoma nasus). But Nase is also sometimes used to refer to any of 20 fish species in its genus Chondrostoma. In Ancient Greek, Chondrostoma means lump mouth, which may refer to its strange bumpy rasping teeth. The common name Nase derives from the German word for nose, referring to the funny protrusion of the Nase’s upper jaw past its mouth. 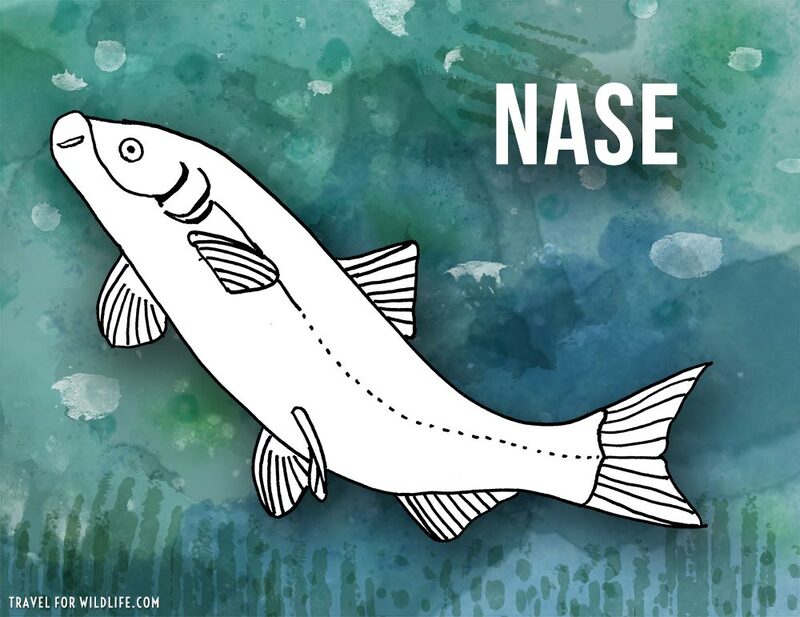 The Common Nase is found in European rivers around the Black Sea, the Baltic Sea, and the North Sea. 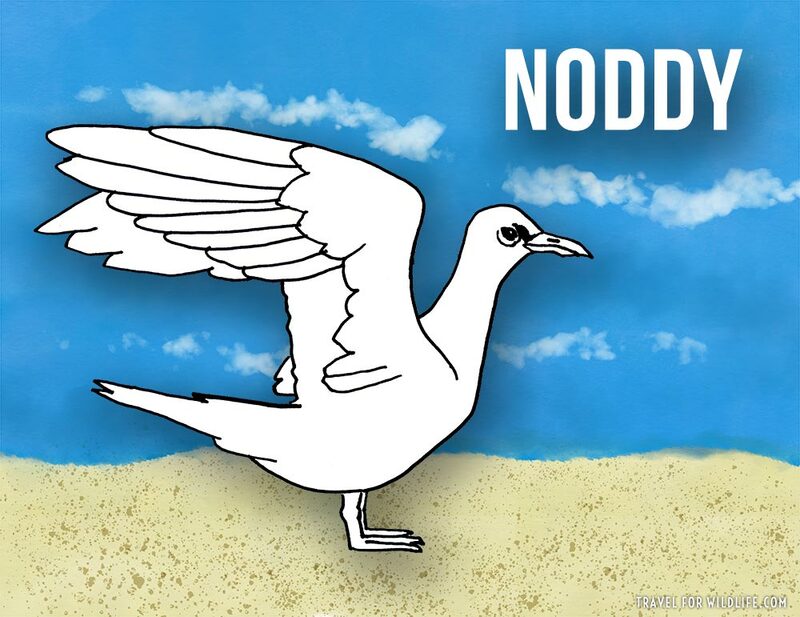 Noddies are seabirds that are closely related to gulls and terns and dippers. Like the dippers, the Noddies catch fish by flying over the surface of the ocean and dipping their bill into the water. There are five species of Noddy in the genus Anous: Brown, Black, Lesser, Blue, and Gray Noddy. The Brown Noddy (Anous stolidus), which I’ve drawn in the illustration below, is found in tropical oceans around the world and nests in large noisy colonies. 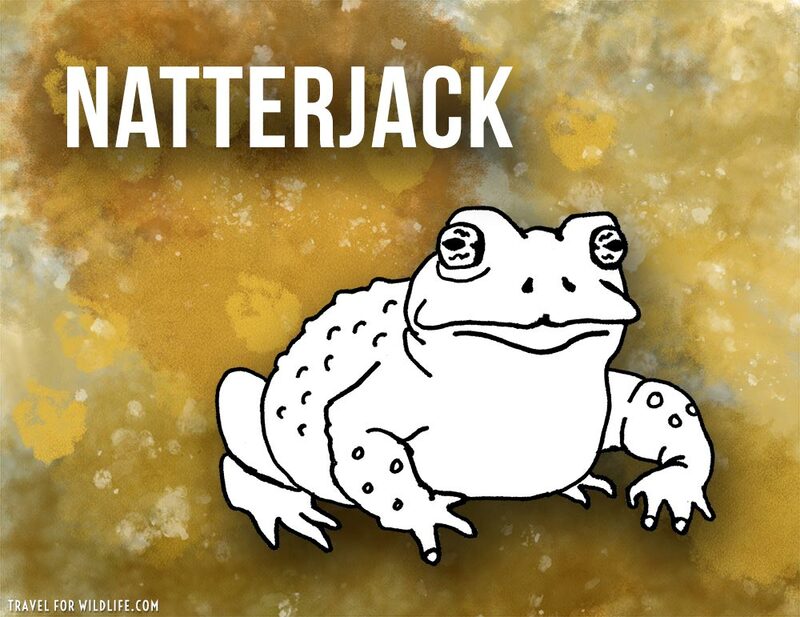 The Natterjack is a toad found across much of Western Europe. The Natterjack Toad (Epidalea calamita) prefers sandy coastal dunes and heath lands. It is easily identified by the yellow stripe running down the center of its back. It is said that the common name refers to the loud call (or natter) that the toads make during mating season. The Common Noctule (Nyctalus noctula) is a mid-sized bat found across much of Europe and parts of Asia. 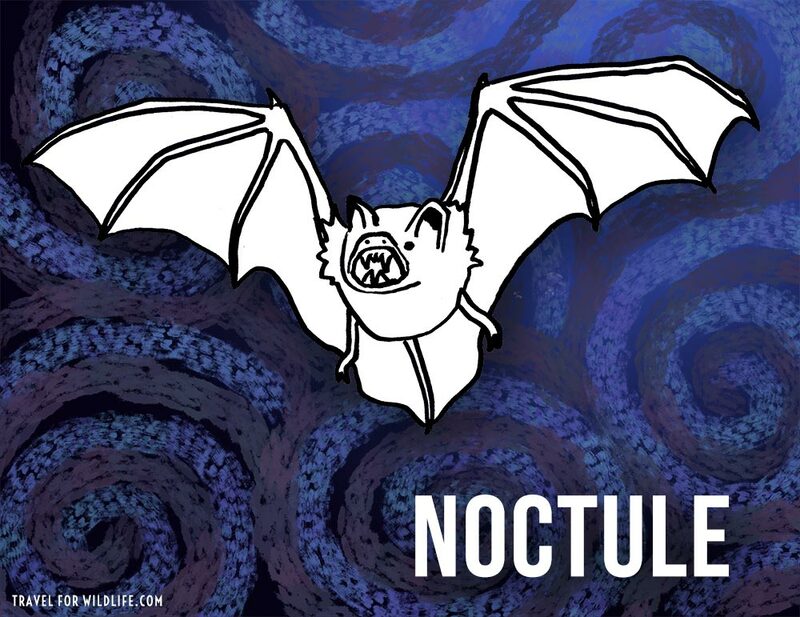 The name Noctule is also sometimes used to refer to any of the 8 species of bats in the genus Nyctalus. In summer, Noctule bats feed on large moths and beetles over forests and wetlands. In winter they hibernate inside rock caves or in human-built structures. They are the most common bat found in many Eastern European cities! 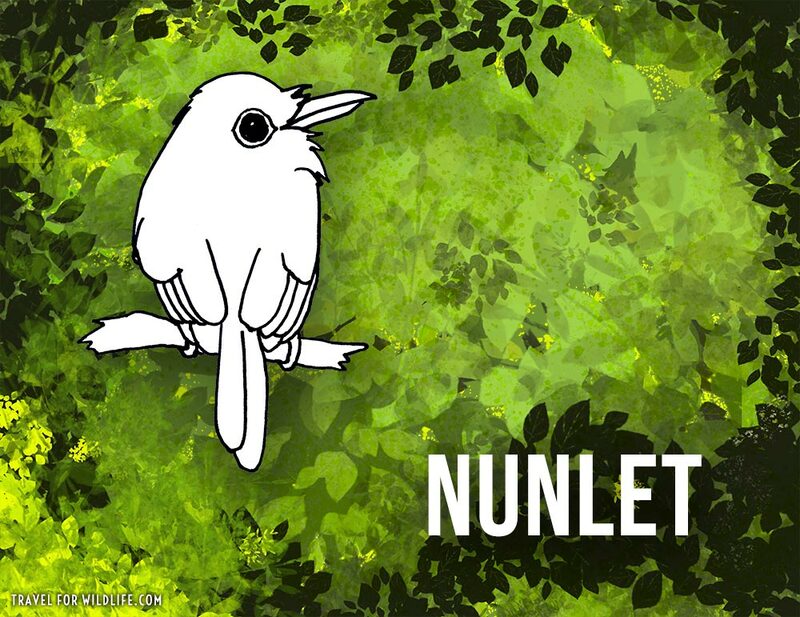 Nunlets are South American puffbirds in the genus Nonnula. There are 6 species but the one I’ve drawn here is the adorable little Brown Nunlet which is found only in a tiny range in Western Amazonia. The Nurseryfish (Kurtus gulliveri) has an unusual reproductive strategy. The male grows a hook on his forehead which he uses to carry a cluster of eggs! Females do not grow the hook. This bizarre technique is called forehead brooding. It is thought that this may be an adaptation to the low oxygen levels and high turbidity of the waters in the swamps and estuaries where they live in Southern New Guinea and Northern Australia. 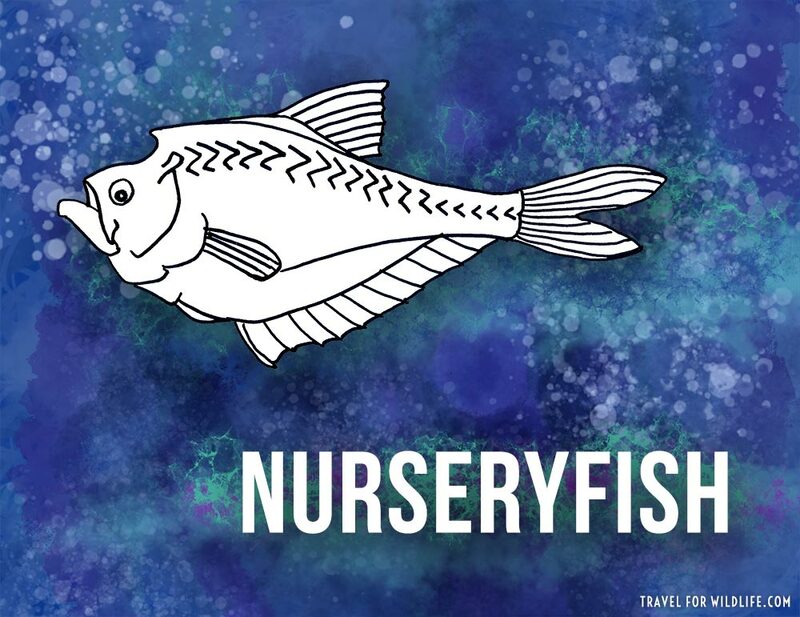 The name nurseryfish is also sometimes used to refer to the other member of its genus, the Indian Humpnead (Kurtus indicus). The males of this species also grows a forehead hook but it is too small to be used for forehead brooding. Definitely in my top five favorite animals that start with n! Nudibranchs are a diverse group of more than 2,300 species of ridiculously colorful sea slugs (gastropods). These bizarre mollusks have no shell like other marine snails, but they do come in every imaginable shape and color. 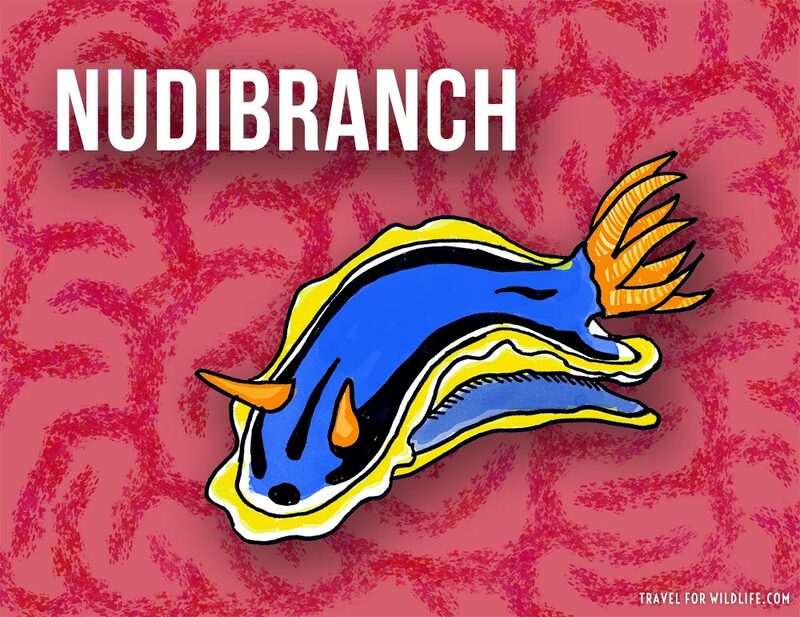 The name Nudibranch (pronounced NEW-dih-brank) means naked gills, referring to the exposed gills that most carry on their backs. The beautiful fellow I’ve drawn here is Chromodoris elisabethina. To see some of our favorite nudibranch encounters in the wild, check out our article about Nimmo Bay in British Columbia, which includes a crazy underwater time-lapse I shot of hooded nudibranchs in action! The Nilgai (Boselaphus tragocamelus) is an Indian species of wild cattle also known as the Blue Bull. 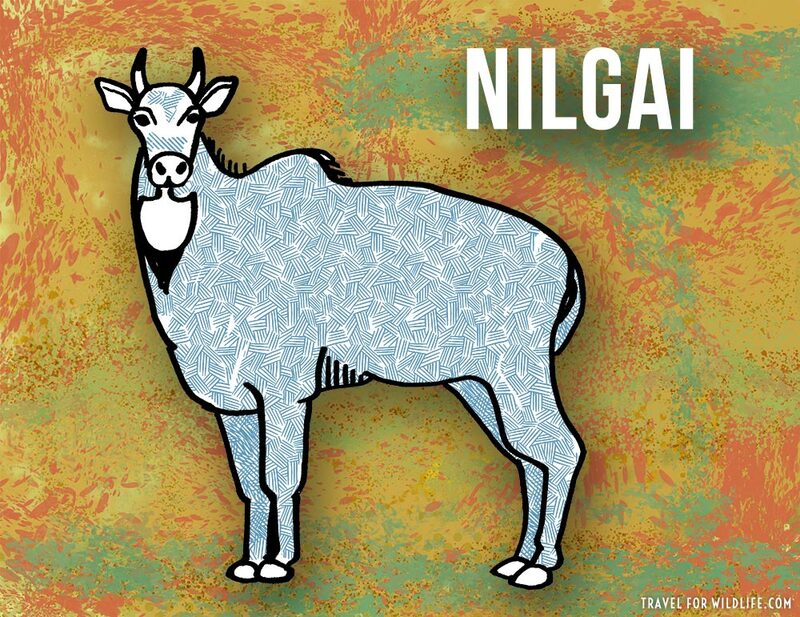 The name Nilgai means blue cow in Hindi (nil=blue, gai=cow). This large antelope is so numerous in some parts of India that it is considered an agricultural pest. The Nilgai is one of the favorite foods of the last remaining Asiatic Lions in India (see What Do Lions Eat?). The rather tiny horns are only grown by males. The Common Nighthawk (Chordeiles minor) is a cryptically colored nocturnal bird that is almost impossible to see in the day. 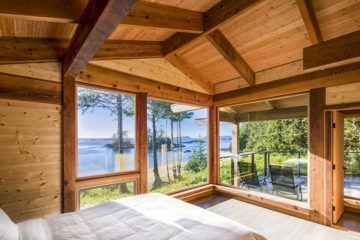 It blends perfectly with its environment. You can tell they’re nocturnal by those huge eyes for seeing in the dark! Nighthawk may also refer to any of the other members of its subfamily Chordeilinae (aka the Nighthawks). The nighthawks are a part of the Nightjar family (Caprimulgidae) listed above as number 10. 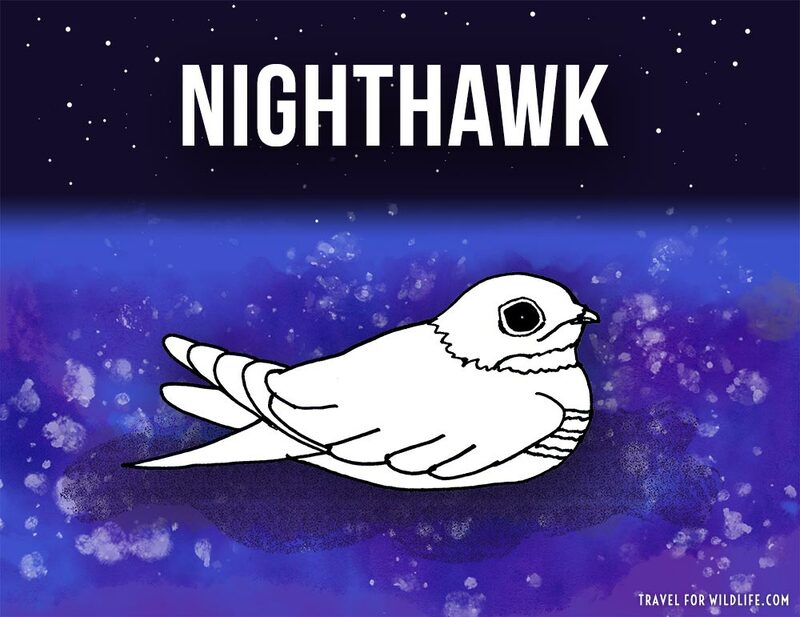 There are 6 species of Nighthawks found in the Americas. Noodlefish are a group of fish species belonging to the Salangidae family. The common name makes perfect sense when you see their long thin bodies and nearly transparent, scaleless skin. These small freshwater fishes are found in south and Southeast Asia where they are a popular food item. 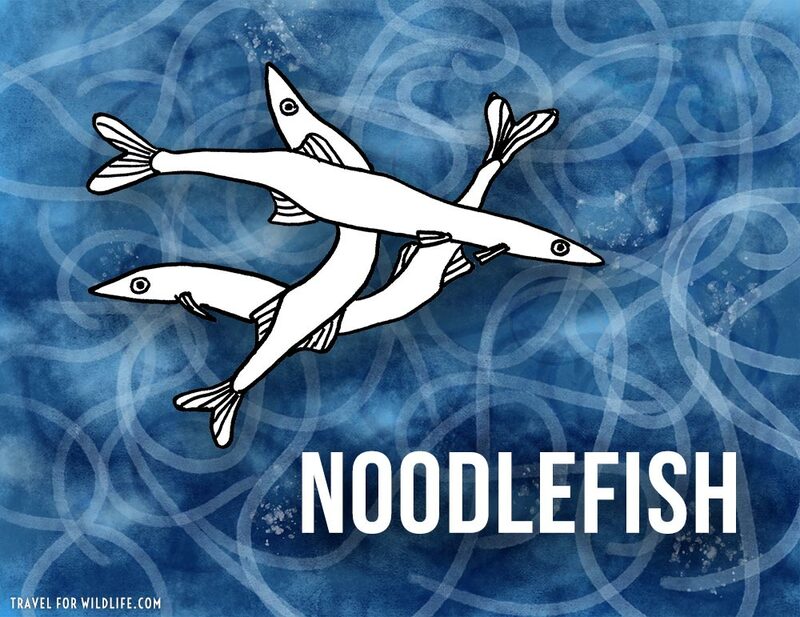 There’s no denying that the Chinese Noodlefish (Salanx chinensis) looks a lot like noodles when cooked in a pan. 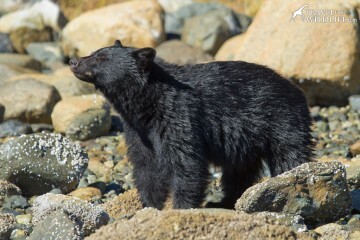 This is one of the animals that start with n that everybody seems to know. The Nightcrawler! (Lumbricus terrestris) I clearly remember wandering around as a child at night with a flashlight in search of these big slimy beasts making their nightly foraging rounds. These huge earthworms go by different common names in various parts of the world, like lob worm, dew worm, or grandaddy earthworm. 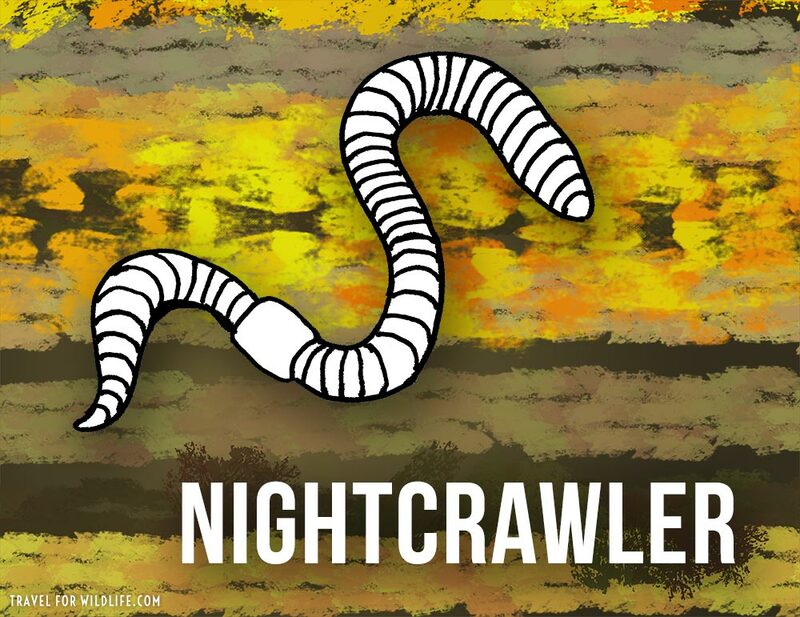 But here in the U.S. we call them nightcrawlers. In 2016 one was discovered in the UK that was a whopping 16 inches long and then another over 24 inches! Unlike most earthworms, nightcrawlers come to the surface to feed on plant matter rather than burrowing through the soil for food. 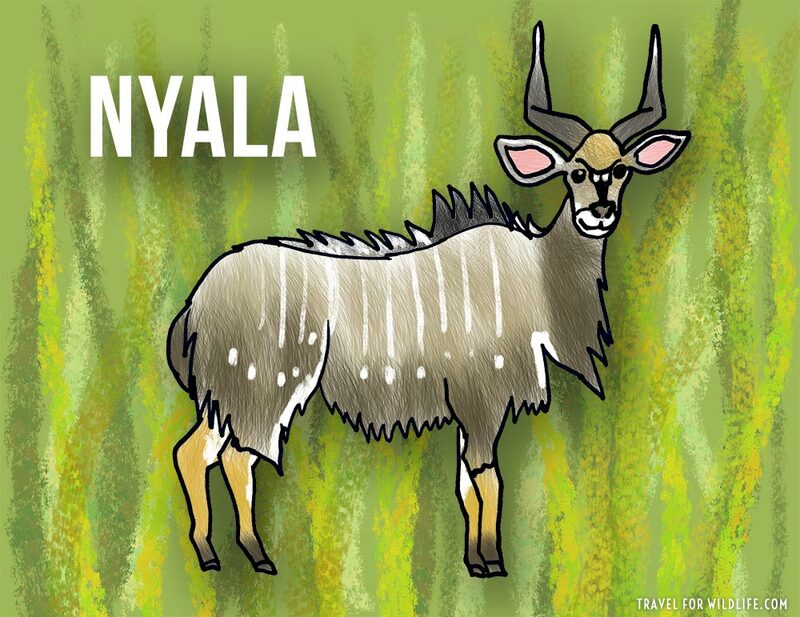 The Nyala is a beautiful antelope native to Southern Africa. The Nyala (Tragelaphus angasii) shows the greatest sexual dimorphism (difference between the sexes) of any of the spiral-horned antelopes. 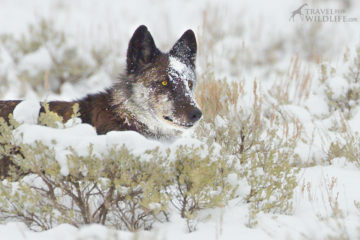 Females and young males start out with a bright rusty orange coat with white stripes and dots. 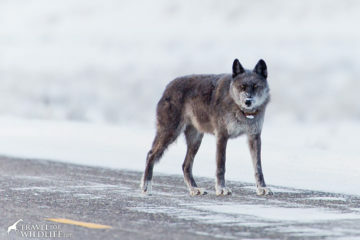 But adult males grow much larger and develop a dark shaggy brown coat tinged with black (like the one I’ve drawn below). Only the males grow the elegant spiral horns. Nyalas are shy and prefer dense cover, making them one of the more difficult large antelope to spot on a South African safari, but we’ve managed to see quite a few during our visits. 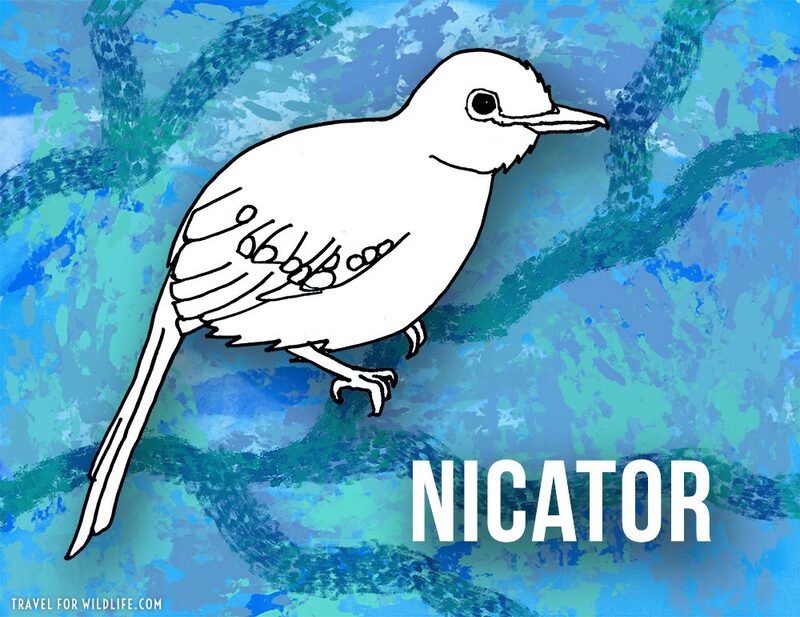 I know, Nicator sounds like the perfect name for an evil cartoon robot who is addicted to cigarettes, but in fact, Nicator refers to a family of songbirds in Africa, the Nicatoridae. There are only 3 species: the Western Nicator (Nicator gularis), the Eastern Nicator (Nicator gularis), and the Yellow-throated Nicator (Nicator vireo). While the name Nicator is derived from the Greek word for conqueror, not a single one of these birds is a super-villain addicted to nicotine. The Numbray (Narke dipterygia) is the most shocking of all the animals that start with n. Literally. If you try to touch one then you’re in for a jolt. This ray can emit a powerful electric shock! Hence the name numb-ray, meaning it will make your arm go numb. Also known as the Spottail Sleeper Ray, the Numbray is native to Australia and hides in the sand before ambushing its prey, wrapping around it, shocking it, and then swallowing it whole with a large expandable mouth. Here is a crazy video of a numbray attacking an octopus! Much like the Nunlet above, the Nunbirds are group of puffbirds in the genus Monasa. 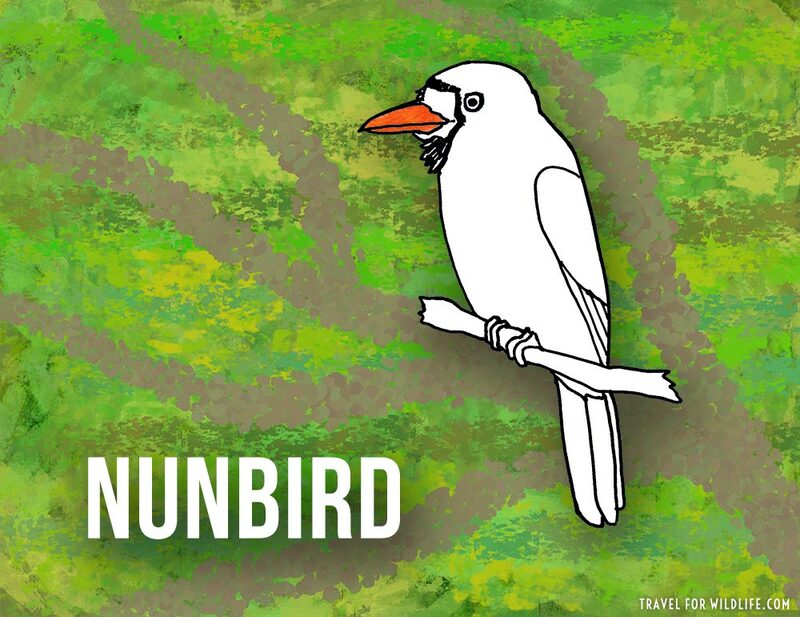 While I can find no reference to the origin of the name Nunbird, I’m guessing it refers to the White-fronted Nunbird (which I’ve drawn below) because it has shiny dark black feathers with a bright white area around the beak to complete the nun’s “habit”. There are four species of Nunbirds in Central and South America. The Numbat (Myrmecobius fasciatus) is another of my top five animals that start with n. First of all, that’s just a fun name to say. Secondly, it’s a fascinating creature. This Australian marsupial has evolved to fill the same niche as the anteaters on other continents. In fact, it’s other common names are the marsupial anteater and banded anteater. And, like the “true” anteaters in the Americas, it has an extremely long tongue and primarily feeds on termites. 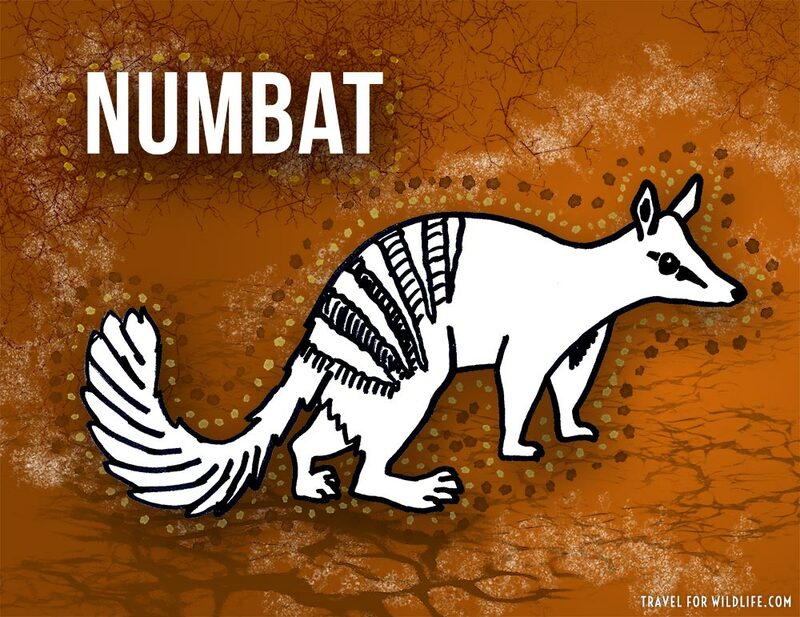 It is an endangered species and according to the IUCN there are less than a thousand mature Numbats left in the wild. Numbats are the emblem mammal of Western Australia and conservation efforts led by the Numbat Recovery Team are managing reintroductions to help bring this awesome little creature back from the brink. Also know as the Piping Cisticola, the Neddicky (Cisticola fulvicapilla) is a robin-sized song bird found only in Central and Southern Africa. Though it is drably colored, it does wear a sporty rusty-red cap. 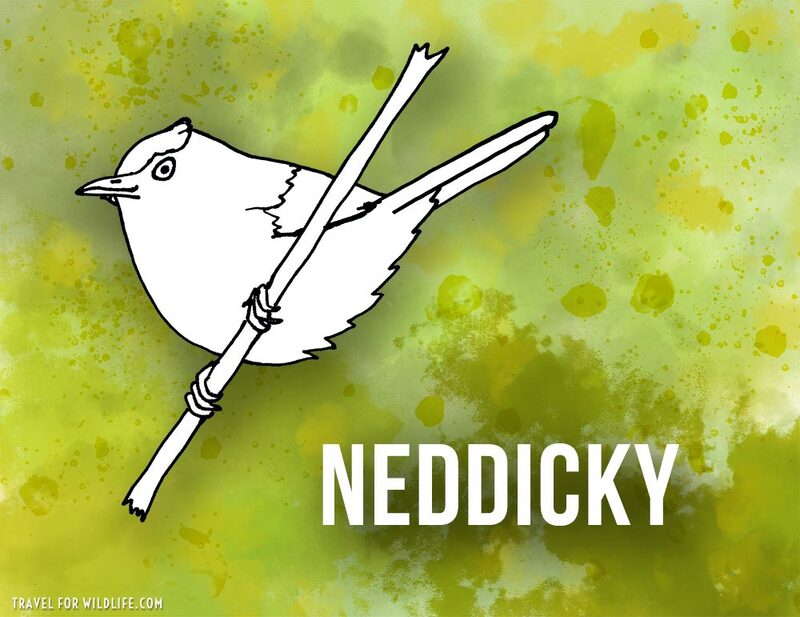 Neddickies build a really cool ball-shaped nest out of spiderwebs and dry grasses, with a small circular entrance on the side. Kind of like a hobbit hole! 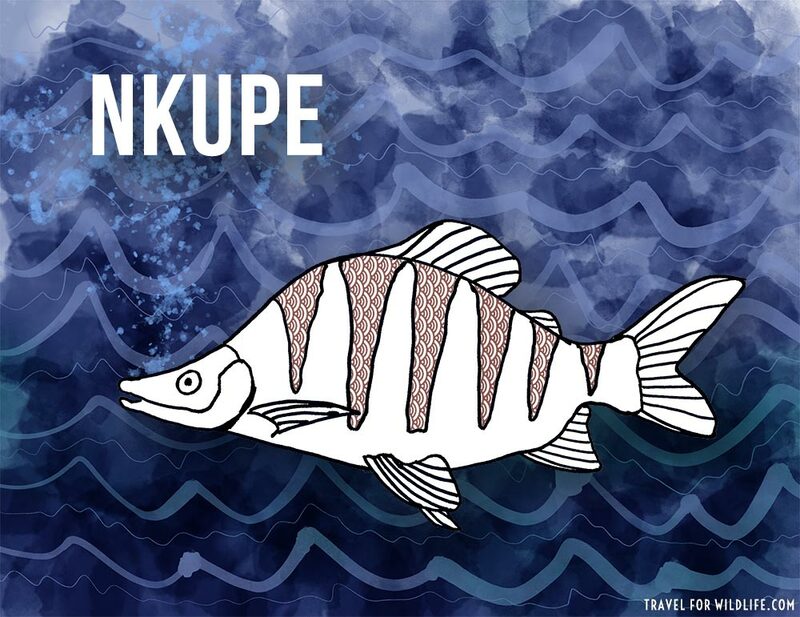 The Nkupe is a freshwater fish that lives in large swift-flowing rivers and lakes of Southern Africa. A popular game fish amongst fishermen, the Nkupe (Distichodus mossambicus) can grow to a weight of about 16 pounds! In Nyanja (the local Bantu language where this fish lives around Malawi) Nkupe means copy, but I have no idea what this fish might be a copy of? Maybe a Stegosaurus? 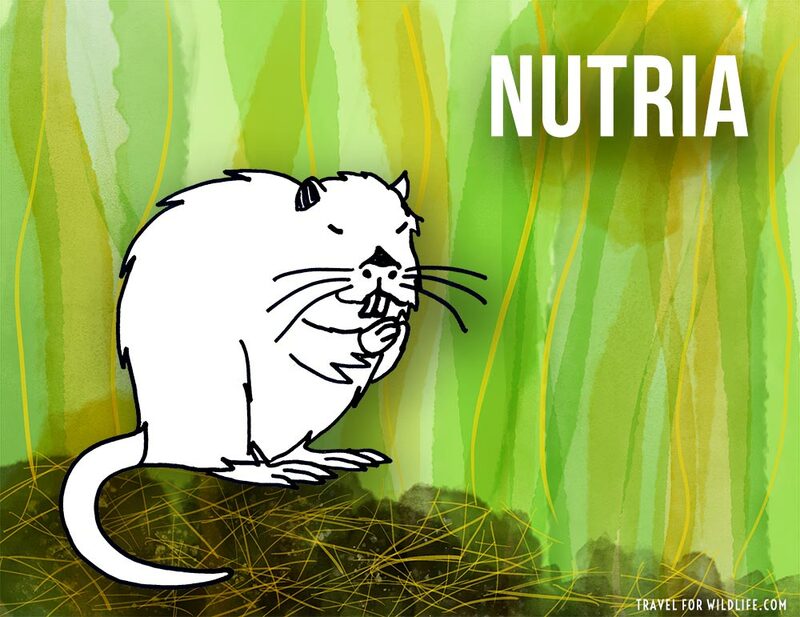 The Nutria (Myocastor coypus) is a large aquatic rodent native to South America. There it is commonly referred to as the Coypu. In the late 1930’s a small group of about 20 Nutria were brought to Louisiana for fur farming. Somehow they escaped and within 2 decades their population exploded to about 20 million individuals. The same story repeated itself in other wetland areas of the U.S. Now they are considered an invasive species in the United States because their voracious appetite for succulent roots has decimated thousands of acres of wetlands. Through no fault of their own, they are now the subject of mass extermination efforts. If you’re interested in the fascinating and sad story of how this South American rodent ended up in the United States check out the wonderfully researched and written book Swamp Rat: The Story of Dixie’s Nutria Invasion. 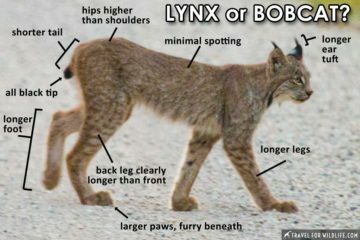 This is one of the only animals that start with N that I’m likely to see in my own yard. The rubber-ducky call of the tiny Brown-headed Nuthatch is especially cute. 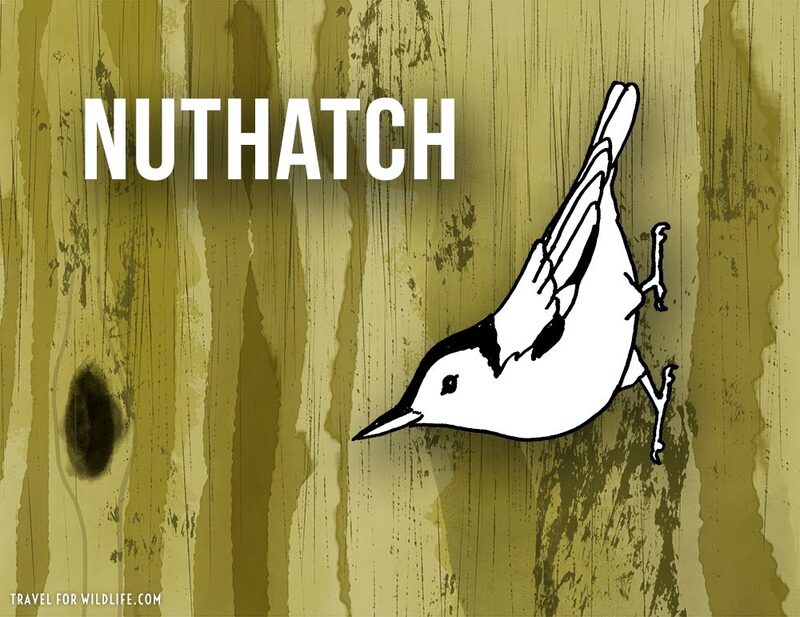 The name Nuthatch refers to any of 28 species in the family Sittidae. 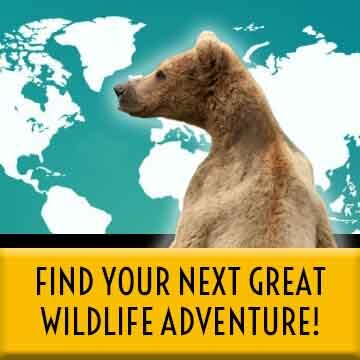 They can be found across North America and Eurasia. The species I’ve drawn below, which is also a frequent visitor to my backyard, is the White-breasted Nuthatch (Sitta carolinensis) in its customary position: clinging upside-down to the bark of a tree. Much like the Numbray listed above, the Numbfishes are a family of electric rays (Narcinidae) found in warm tropical waters around most of the world. The one I’ve drawn below is the the Tasmanian Numbfish (Narcine tasmaniensis). Like other electric rays it possesses a pair of large electric organs that are positioned on each side of the head. It can defend itself from predators by discharging a moderate electric shock. Zap! Nutcrackers are members of the Corvid family (along with crows & jays). They include 3 species in the genus Nucifraga: Clark’s, Spotted, and Large-Spotted. The one I’ve drawn below is the Clark’s Nutcracker that lives high in the Rocky Mountains of the US and Canada. They use their thick bills to tear open pine cones and retrieve the seeds, which they carry in a pouch under their tongue and then bury elsewhere for the winter. 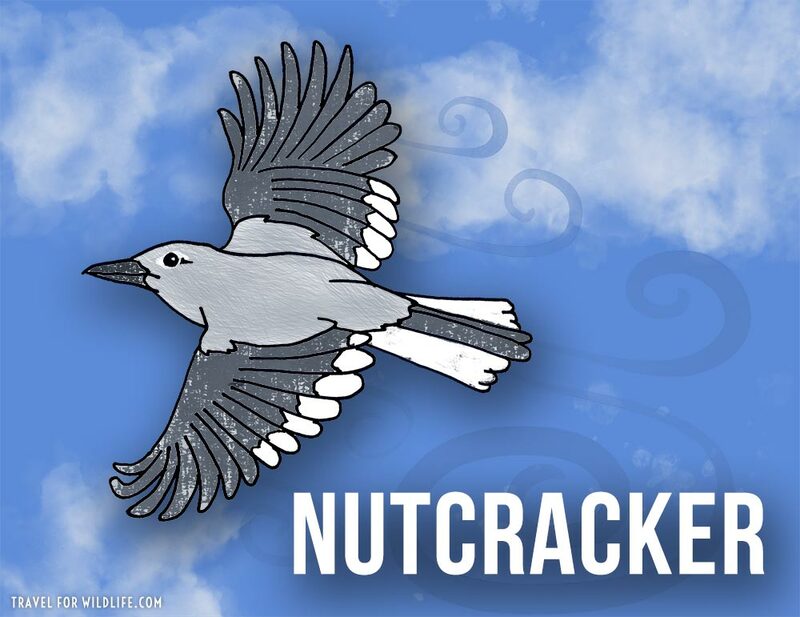 A Nutcracker may bury more than ten thousand seed each summer and can remember where most of them are! They ones they forget play an important role in regenerating pine forests! 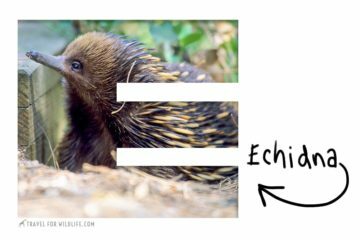 What do you get when you add a pointy nose, a prehensile tail, a super long tongue, and tarsier feet to a tiny hyperactive marsupial that only eats flower nectar? The Noolbenger! Number five on my top five list of favorite animals that start with n! The Noolbenger (Tarsipes rostratus) is so different from other marsupials that it gets its very own family called the Tarsipedidae. Found only in the extreme southwest corner of Australia, this tiny creature is the only truly nectarivorous marsupial on the planet. While its other common name is the Honey Possum, it is not actually a possum, nor does it eat honey. Rather it survives entirely on flower nectar and pollen. 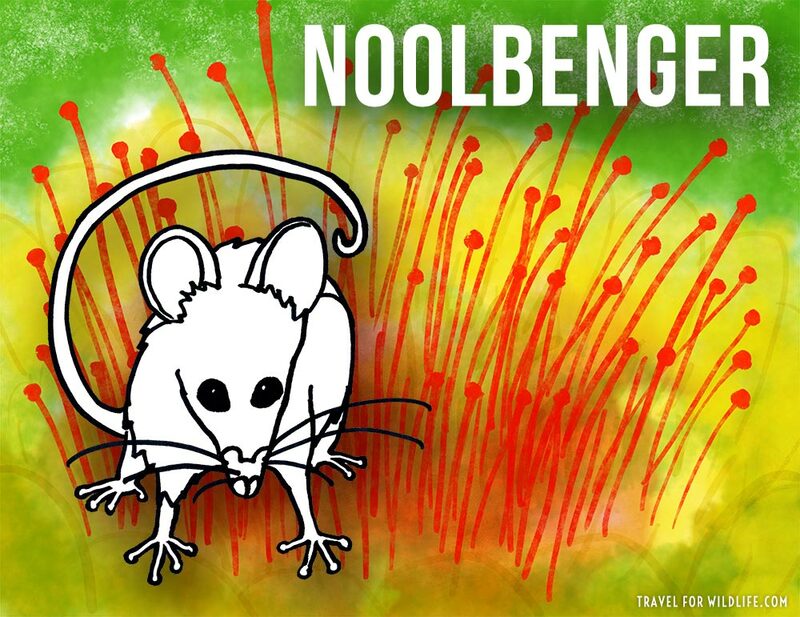 The mouse-sized Noolbenger weighs no more than 10 grams but can drink up to 7 ml of nectar a day! According to Bush Heritage Australia, this would be like a human drinking 50 liters of soda a day! Much like a hummingbird, the Noolbenger’s extra-long bristly tongue moves rapidly in and out of its mouth to lap up nectar about three times per second. And also like hummingbirds they are important pollinators for many flower species. Unlike most mammals, it doesn’t use claws for climbing but instead depends on expanded finger tips to grasp branches like a primate. In fact its family name Tarsipededidae refers to the resemblance of its feet to the Tarsier, a primitive primate. I love the Noolbenger! Narwhal (Monodon monoceros), an Arctic whale. Numbat (Myrmecobius fasciatus), an Australian marsupial anteater. Nutria (Myocastor coypus), a South American aquatic rodent, aka Coypu. Nyala (Tragelaphus angasii), an African antelope. Nabarlek (Petrogale concinna), an Australian marsupial, aka Little Rock Wallaby. Noolbenger (Tarsipes rostratus), an Australian marsupial, aka Honey Possum. Nilgai (Boselaphus tragocamelus), an Indian antelope, aka Blue Bull. Ningaui, tiny Australian marsupials in the genus Ningaui: Wongai, Pilbara, & Southern Ningaui. Noctule (Nyctalus noctula), a Eurasian bat, aka Common Noctule, or one of 8 species of bats in the genus Nyctalus. Napu (Tragulus napu), a Southeast Asian ungulate, aka Greater Mouse Deer. Nightingale (Luscinia megarhynchos), a Eurasian song bird. Nene (Nënë) (Branta sandvicensis), an endangered Hawaiian goose. Nighthawk (Chordeiles minor) a nocturnal bird, aka Common Nighthawk. Neddicky (Cisticola fulvicapilla), an African song bird, aka Piping Cisticola. Nightjar about 100 species of nocturnal birds in the family Caprimulgidae. Nutcracker 3 species in the genus Nucifraga: Clark’s, Spotted, & Large-spotted Nutcracker. Nicator genus of songbirds in Africa. 3 species: Western, Eastern, Yellow-throated. Noddy tropical seabirds in the genus Anous, 5 species: Brown, Black, Lesser, Blue, Gray. Nunbird Central and South American puffbirds in the genus Monasa, 4 species. Nunlet South American puffbirds in the genus Nonnula, 6 species. Nuthatch clinging birds of the genus Sitta, 28 species in North America and Eurasia. 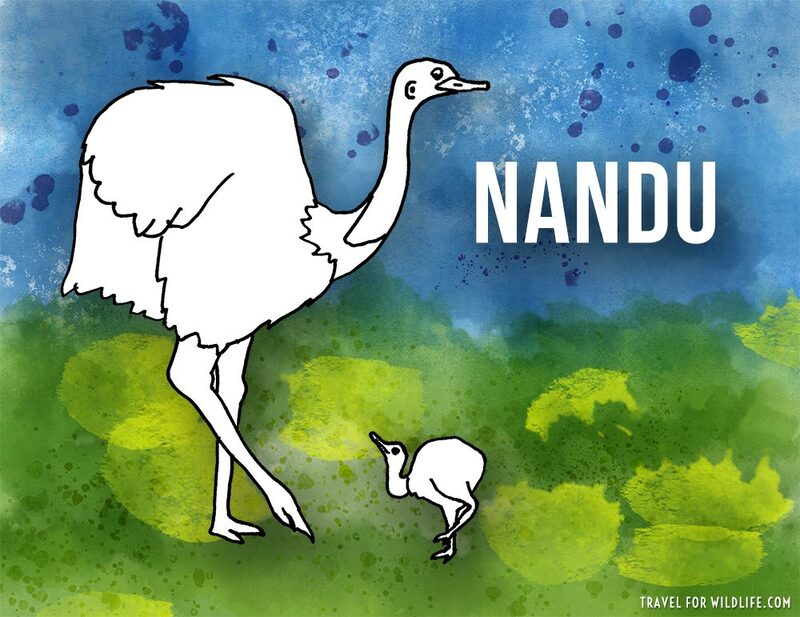 Nandu 3 species of large flightless birds in South America, aka Rhea. Newt salamanders in the subfamily Pleurodelinae. Natterjack (Bufo calamita), a European toad. Needlefish tropical saltwater fish belonging to the Belonidae family. Nalolo (Ecsenius nalolo), a Combtooth Blenny. Nase (Chondrostoma nasus), a European freshwater fish. Nightfish (Bostockia porosa), a freshwater perch in Southern Australia. Nkupe (Distichodus mossambicus), a freshwater fish in Central/Southern Africa. Noodlefish freshwater fish belonging to the Salangidae family in Eastern Asia. 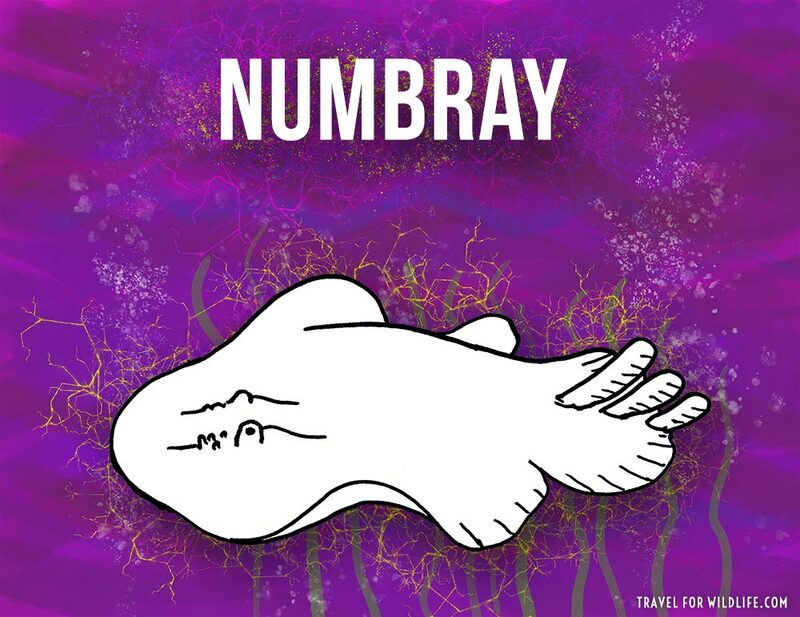 Numbray (Narke dipterygia), an electric ray in Australia, aka Spottail Sleeper Ray. Numbfish tropical electric rays in the Narcinidae family. Nurseryfish (Kurtus gulliveri) brackish-water fish in northern Australia & New Guinea. Nautilus (Nautilus pompilius), a cephalopod with a chambered spiral shell. Nudibranch one of more than 2,300 species of colorful sea slugs (gastropods). Nightcrawler (Lumbricus terrestris), a large earthworm. Nematode roundworms belong to the phylum Nematoda. 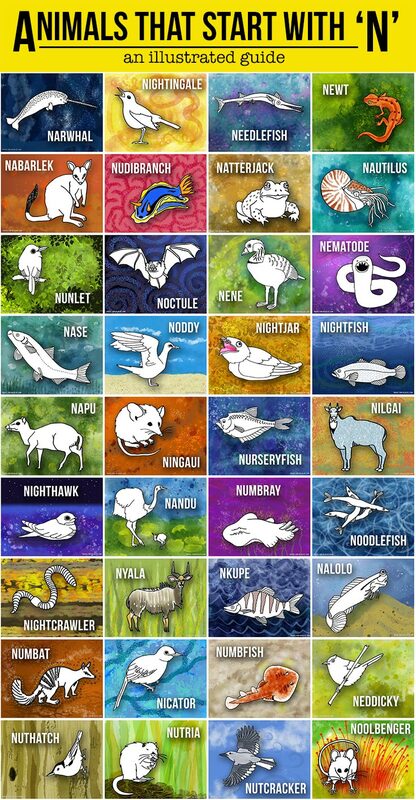 Did you enjoy our illustrated list of animals that start with N? Pin it! 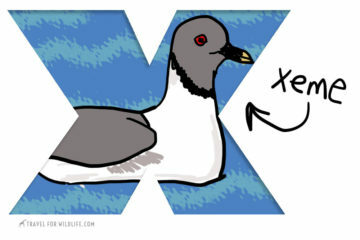 If you enjoyed out list of animals that start with n, please pin it on Pinterest!